In Faith, never give up – Chant Together for Victory! I am Ritika Kaushik & I, along with my two children, took up faith in Nichiren Diashonin’s Buddhism an year ago. I, along with my elder son Chinmay, we are writing in to share a beautiful experience of our life. Its been an year that I am practicing this philosophy, but I was not following the correct path of doing regular prayers and chanting abundant Daimoku. I was facing a lot of challenges some time ago, related to personal and professional life. Struggles are still there in my life but now I am not scared! I have complete faith that everything will surely be sorted out. I would like to share one of the experiences that is related to my son’s school admission. 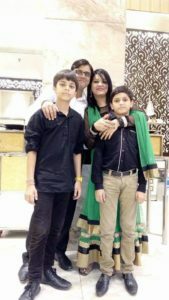 I have two kids – my younger one got admission in another school but unfortunately, the elder one who scored very good marks in his class 8 examination, was somehow not able to clear the entrance test. We requested the Principal to give one more chance but she denied us clearly – the very first day. (Those days I used to do only my morning Gongyo, neither Daimoku nor the evening Gongyo). Second day I thought to again meet the Principal. I took an off from my office and went there but everything was in vain. She made us wait approx. 2 hours and then told the receptionist to ask us to leave. I continuously chanted in those 2 hours in school itself and then I requested the receptionist to try one more time from her end and only let us meet the principal atleast once. Finally, the Principal met us and gave one option – that was to shift my son to class 8 again which meant he had to “repeat one year” of school as there were no seats available for class 9th. Without even thinking twice, I said Yes to it. After that the Principal asked us to wait for 2 more days after which we would get the details for the admission. My son Chinmay’s experience : When Mom told me and made me understand that I might need to repeat my class 8, I was very disappointed and felt like crying because I had scored good marks in school. I scored 82% but still I was not able to get an admission into the next class and that made me very sad! Mom gave me encouragement and reassurance that by chanting and praying, everything would be sorted out. Since then, I only had “Nam-Myoho-Renge-Kyo” in my mind and soul and started chanting. I started doing morning and evening Gongyo and chanted daily. I also started visiting a senior member, everyday with my Aunt, and also wrote my prayers in my goal dairy. Ritika: Now, when I came back home from the school, my parents & husband started expressing their views on the incident and felt all that happened was very wrong. But I really wanted my son to join that school so I requested my family to wait for 2 more days. I called my seniors in faith and my fellow members for guiding me correctly. ‘No victory is an outcome of a single handed effort, it is an outcome of teamwork’. I am truly blessed to have such seniors in Gakkai who fought alongside me in every challenge & every struggle. A perfect example of ‘many in body, one in mind’. They made my struggle as their own, by sharing my pain, pouring in lots of Daimoku into my life and being there for me always to listen to me patiently for hours in order for me to empty myself of my sufferings. Holding my hand and guiding me, they helped me base my life on the Gosho and start everything with strong resolute Daimoku. They guided me how to be victorious with my own Faith, Practice & Study. I never gave up!! At that very moment, everything seemed like a miracle to me but deep down in my heart, I knew that all this was made possible only through my strong prayers & great Ichinen! I can’t explain in words the pain my family and I suffered through all this. Chinmay: The moment Mom called me on Nana’s phone to let me know that I finally got the admission in class 9th, I felt like it was Magic! I immediately made a vow to the Gohonzon that I will pray daily and make sure that I learn how to read the Gongyo as well, before my next district Zadankai (monthly meeting). And I am very happy to report that I have achieved this Goal ! My Mom and I used to pray that my father should also join the practice with us and I am happy to also report that today my father is here with us in the monthly meeting. This is our second major victory! Ritika: I vow to be victorious, no matter what! I was not able to chant together with anyone, not able to do home visits because I have a lot of responsibilities of my family and profession. But I read the Gosho daily, with my heart and with my own life. I did my Diamoku in office the moment I got free and listened to the chanting audios of Nam-Myoho- Renge-Kyo. I listened and chanted in my coach daily, in the mornings and evenings, during travel to and from work. I even shared my experience with my friends in the office and I am happy to report that most of them are now chanting. I want to steal every single second I can, to be able to chant. And through my own experience, I can confirm that ‘if we work for the Law, the Law definitely works for us’. I always hoped that my husband would also join the Gakkai but I never forced him. This time, for this monthly meeting, he himself said he would like to come along and be a part of it all. This is another major victory for me! It has been possible only through my continuous exertion and Faith in the powers of The Mystic Law, ‘Nam-Myoho-Renge-Kyo’. I would also like to express my gratitude towards the Gohonzon, my mentor Ikeda Sensei & my fellow comrades in faith who guided me continuously to fight for Kosen Rufu no matter what. I am happy that I took up this practice and now I determine to “Never Give up in Faith”! I vow to bring great happiness into my life & my family members’ lives, my district members’ lives & most importantly, I vow to make sure that both my sons, Chinmay & Nikshit, become capable YMDs in future & make Ikeda Sensei very proud! Finally, I understand that every pain has a deep meaning. It is an opportunity to rise from mediocrity and achieve our true potential. This is what we all found as a family. We fought together, prayed together & became victorious together! And so I would like to be a part of the Vision & Mission that the team of Together We Chant has, through this website and their upcoming app, TogetherWeChant – SGI Buddhism.